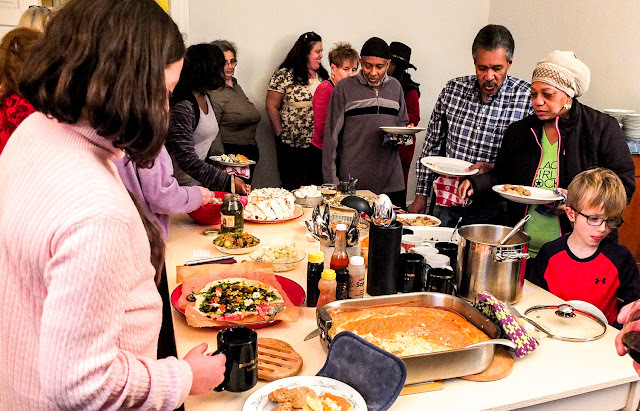 As Cornbread Supper celebrates its ninth anniversary, if you aren't already coming, here are a few answers to questions you may have. Bring a dish or a bottle to share, or just come. Bring a good listening ear, children, friends, a bright spirit, a good story. There's a lot more specific information on this website: look in the sidebars and you may find answers to your questions. New people come almost every week. We do have corn-something on the table every week. Usually it's Kentucky black skillet cornbread, vegetarian and naturally gluten-free. Cornbread Suppers tend to start very close to 6 PM. If you come later, you will probably find things to eat, but there may not be many options. Every once in a while, especially in July and August but other times as well, something will change and Cornbread Supper will not be at 250 Campsie Place in Lexington, Kentucky at 6 PM on a Monday night. It's a good idea to check the Cornbread Suppers facebook page before coming. The latest news about any changes will be there by late Sunday night. The hosts also send out a weekly email on Sunday evenings to anyone who asks to be on the email list. If you'd like to be added to that list, click the "Contact" button at top right and be in touch. If you plan to drive to Cornbread Supper, there is plenty of nearby parking. Please read and kindly follow these parking requests.